LEON Pietersen started out as a second-string sprinter, only to become the first 15-year-old South African Senior Schools Sports Association (SASSSA) athlete to run the 800m in under two minutes. The switch from the sprints to middle distance racing was as simple and successful as that. 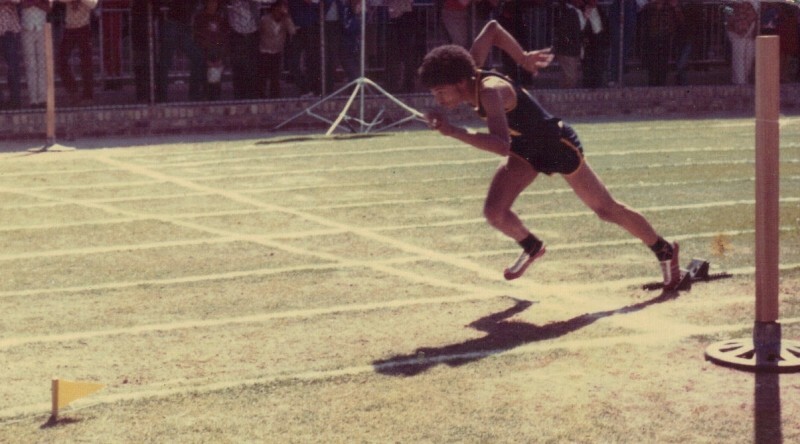 Pietersen remembers being Sunnyside’s Primary School’s second-string sprinter to Howard Fester, a stand-out and popular primary schools athlete in the mid-1970s. Leon Pietersen, 14, sets a 200m record of 24 seconds while a pupil at Sunnyside Primary School. “I could not pass Howard in the 100m but I was still full of running,” Pietersen recalls. “I did much better over the 200m and held the record.” In the boys under 15 age group at the South African Primary Schools Sports Association (SAPSSA) meeting held in Durban in 1978, Pietersen set a 200m record of 24 seconds flat. At the same SAPSSA meeting in Durban, he stirred great excitement by smashing the 800m record in a time of 2 minutes and 2,6 seconds. Not being able to succeed as a sprinter, in the long run, Pietersen soon discovered his natural flair for the 800m track event and became the first 15-year-old (under 16) athlete to run the 800m in under two minutes under the banner of the SASSSA. All of his track success started when he was plucked from the sprints by his Physical Education teacher Patrick Steenkamp, himself an athlete while at Alexander Sinton High School and Hewat Training College. Steenkamp noticed how the rangy Pietersen, still full of running, could not pass Fester because of the lack of outright speed in the 100m. He recognised the young athlete’s potential as a great middle distance runner and started to coach him. Leon Pietersen, 15, with his Uncle George Dearham, at the King’s Park Track, Durban, in 1979, where he crashed through the 2-minute barrier in a time of 1 minute 57,7 seconds. “Mr Steenkamp put me on a programme of rigorous training in the sand opposite the Hewat Training College [which has now been developed to an extension of Kromboom Road in Crawford, Cape Town],” Pietersen says. In the meantime, Fester’s career fell by the wayside in high school to Wilton Pick, Tauriq Achmat, and Jonathan Williams, “the bloke from Heatherdale Primary School”. By that time, Pietersen was an established 800m athlete. In 1979, as an under 16 800m Western Province athlete, Pietersen had crashed through the 2-minute barrier in a time of 1 minute 57,7 seconds in Paarl. That year he also won the 1 500m in a time of 4 minutes and 14,9 seconds. At Western Province Senior Schools Sports Union (WPSSSU) level Duncan Crowie of Cathkin High School, famous for his footballing skills and achievements, held the boys under 16 800m record of 2 minutes and 00,9 seconds until the books closed in 1994. Crowie had set the record at his school’s sectional meeting at Athlone stadium. Leon Pietersen of Alexander Sinton High wins another 800m race at Athlone Stadium. Crowie was placed second behind Pietersen at the Champion of Champions athletics meetings. In spite of being the WPSSSU 800m record-holder and being placed second at the champs, Crowie wasn’t selected for the WPSSSU team because of the WPSSSU selection policy. An athlete had to feature in two events. Crowie participated in one event. As an under 17 athlete, Pietersen made the switch to the 400m and 800m track events with huge success. “I didn’t particularly like the 1 500m. In the junior age groups, we had to run the 800m and 1500m. The 400m only started to feature on the programme in the under 17 age group. “To just run the one lap (as opposed to the two laps in the 800m), made the 400m enjoyable for me. You could just go out there, spend your energy and run,” says Pietersen. Leon Pietersen in action at a packed Athlone Stadium in 1981. Aware of his abilities, Pietersen would win in a canter. “I never had anyone competing with me in my age group,” he says. This was especially true when in 1980 Pietersen held the 400m (51,3) and the 800m (1 minute 56,9) Western Province Senior Schools Sports Union (WPSSSU) records. Another highly-talented runner, Theo Desmore of Trafalgar High School and Trafalgar Club, broke Pietersen’s 800m record in a time of 1 minute 56, 4 seconds in 1990. However, Pietersen’s 400m record stood until the books closed in 1994. At high school, Pietersen never had a coach and did not train as intensely as when he was coached by Steenkamp in primary school. Leon Pietersen is seen striding home in the 400m at the Champ of Champs in 1982. “I never really had a coach at high school but Robin April (Spartans chairman and former 800m champion), Willie Davids (club coach) and Herman Abrahams (secretary at Spartans and teacher at Alexander Sinton High) did play a part in my training at Spartans,” says Pietersen. Pietersen competed two more years in the boys open at school level and helped lead Alexander Sinton to victory at the Champion of Champions in 1982 when he again qualified for the province team. His big friend, the late Bernard Adams of Livingstone High School, was with him in the province team throughout their careers. “BA was a dedicated athlete who loved competition and always strived to do his best in all that he did. He would never back down from a challenge and was a great motivator for his fellow athletes,” Pietersen remembers fondly. “As a friend, he was second to none. He was loyal and honest with a great sense of humour and put his friends above all else. He was the guy that would support you till the end and lift you up when you were down. Friends like that are few and far between,” Pietersen says in a tribute to this great athlete who passed away in July 2015. Bernard Adams and Leon Pietersen. During his high school years, Pietersen competed regularly in the club meetings at the Athlone Stadium. Here he saw the talents of the great Freddie Williams, Tommy van der Westhuizen, Ian Rutgers, George van der Burg and many others. Even though he is a year younger, Pietersen competed against Freddie Williams on two occasions (in the boys open 800m), and lost. The first 800m took place at the Athlone Stadium at the Champ of Champs (1981) which Williams of Hewat Training College won in a time of 1 minute and 57,94 seconds with Eugene Moodley of Rylands High second. Pietersen was third. Williams also won the 1500m on the day with Moodley second again. B April of Hewat was third. Pietersen, though, won the 400m with football star Ronald Campher of Hewat second and S. Dollie of Spes Bona third. Pietersen’s second loss came at the South African Amateur Athletics Board meeting in Port Elizabeth in 1981 where they competed as two junior men athletes. On the day, Williams won three races: the 800m, 1500m and 3000m. Leon Pietersen (WP), Christo Petersen (Boland) and Booi Visser (Boland). The year 1982 was his last year when he had the opportunity to compete on the tartan surface of the Vygieskraal Stadium. His races were near-record pace in the 400m and the 800m, but a lack of drive and enthusiasm saw him compete for the last time at the South African Amateur Athletics Board meeting in Paarl in 1982. His rivals in that race were Boland’s Christo Petersen and Booi Visser. At the Paarl Championships, he won the 400m in 50,30 seconds but lost the 800m to Christo Petersen in a time of 1:55,5. Visser was second, Pietersen third. Petersen, too, did not make the step-up to senior level. Visser competed as a senior in the men’s 1500m at the SAAAB championships in Port Elizabeth but found the going heavy. Not making the step up to senior level does not detract from the fact that Leon Pietersen was a class act: he had beautiful form as an athlete, and his stride was ideal for the 800m in which he impressed since day one at Sunnyside Primary School. “The athletics scene was very competitive and athletes were eager and willing to participate. There was no shortage of talent,” Pietersen reflects on local athletics during his youth. Pietersen also recalls the communities making an impact on the athletics as it was the biggest summer code of sport at the time. Leon Pietersen’s Western Province athletics colours for primary schools, high schools, and clubs. “Parents and retired athletes would assist in making the athletics meetings a success. Athletes worked hard to make their community and school proud at these inter-schools meetings,” he says. In 1982, Pietersen was one of four athletes who had formed the core of the team in winning the Champ of Champs for Alexander Sinton. Pietersen was also a seasoned hockey player. He played hockey for the Penlyn-based Callies (California) hockey club, a club in the area where he grew up. “I started at Callies and then went on to Belmont. Stanley Brickwa, a top baseball pitcher of Lansdowne Baseball Club, Western Province, and the South Africa Baseball Association, started the Lansdowne Hockey Club which I joined because it was nearer to home,” says Pietersen. Stanley Brickwa, centre, and Leon Pietersen, right in action for Lansdowne Hockey Club at Clover Crescent in Athlone, Cape Town. After playing hockey for Lansdowne, he joined Mocambo Hockey Club. It was here that he met up with the great Cecil Blows who himself was an eight times national sprint champion. “Mr Blows was a fantastic hockey player and coach. His great advice on my training led to me being selected for the Western Province hockey team in 1994. Mr Blows was also an administrator at the club has held the position of treasurer,” recalls Pietersen. Pietersen remembers Blows as a player at Mocambo, playing the game well into his 40s.